I’m very excited about the outlook for our team this season. 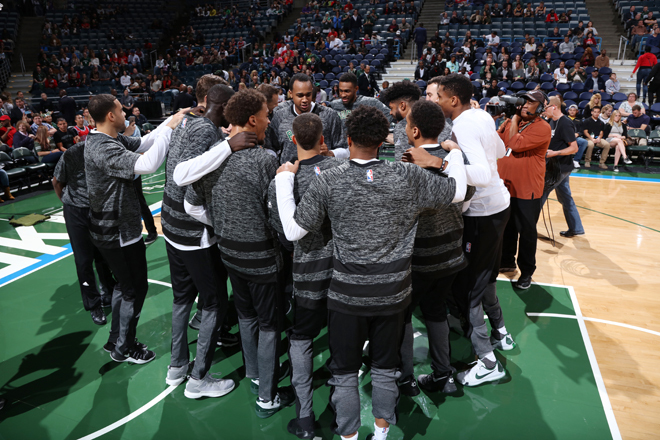 I think everybody is enthusiastic about what’s taking place here in Milwaukee with our young team, the way that it’s growing, and the way guys are competing. It’s just a matter of time for us to have success and hopefully win a championship. 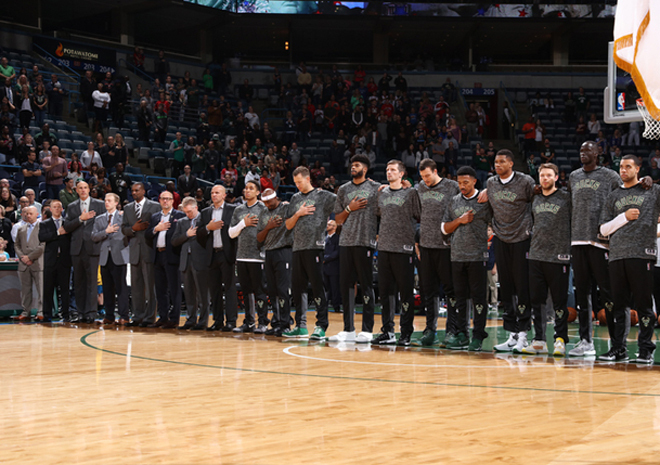 In my first year here with the Bucks, I think we exceeded expectations. That group played hard, they wanted to win, and they did everything to win. Last year we were so much younger and had trouble understanding that coming in with expectations makes winning a greater challenge. We didn’t meet that challenge, but we learned from that challenge. We learned that it’s not that easy, and you’re never guaranteed to get back to where you were the season before. I think it’s good that some of the young guys on our team went through both those seasons, and we have that experience to call back on. Hopefully, we can apply that to this season. We came out of last year with a great young core here. Then we went out this offseason and added some key pieces to our group that give us different strengths, and a lot more depth at every position. We’ve got six new guys on this team, so this is a somewhat new group with that young core. 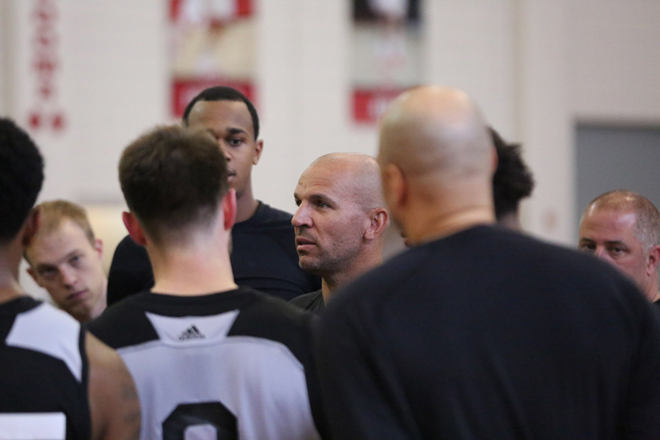 In training camp and the preseason, we went through the learning process, sort of figuring out who plays well with one another, and defining everybody’s role. That helped us understand what we’re able to do as a team. I also want to make sure my guys are having fun out there. It’s a game. It’s supposed to be fun. I think we sometimes lose sight of that. When guys are having fun, they tend to maybe play a little bit better, focus a little bit better. I think one of the biggest things is just learning about each other, and understanding what makes someone tick. So we use that time in training camp to see everybody’s personality: their likes and dislikes. That’s what that time of the year is for. When you go through that, then, when it becomes real and you start the marathon, that’s already established. From there, you can continue to have that fun and excitement while also acknowledging that it is serious and that we’re out to try to win. As a coach, you always want it to be perfect. You expect perfection. But more than that, for me, it’s about energy and effort. It’s not always going to be perfect, but can we continue to play to the end? Things might not go well, but there’s always different things you can do to help your team win. And are you doing your job? Are you staying in your lane to help your team? Helping guys see that is one of my jobs as a coach. I think that we’re probably ahead of schedule from where we were last year. I don’t know if that’s good or bad, but I think the guys understand what we’re trying to do. We’re getting kind of back to where we were the first year, understanding how to use our length and that we have to use our length if we’re going to have any success on the defensive end. I’ve heard us referred to as, “Team All-Length” and I think that’s great. Length can be a great weapon in this game. It can make the game very easy if you utilize it correctly. But if you don’t utilize it, it doesn’t work. We’ve got to be able to use our length and be in the right spots. If we can do that, that gives us a chance. Every year, we have team goals of what we want to achieve. The team has set those for this season and that’s great. My job is to help them get to those goals, and that starts with forming a team and playing as a team. The little things of playing hard and playing together come with that, and if you’re doing those things, the wins and losses will take care of themselves. We’ve always hung our hat on playing defense, and playing hard, playing as a team, and playing for one another. It’s not just one person who wins or loses a game. We win as a team and we lose as a team. And most importantly, we want to make sure that we are getting better each time we take the floor. 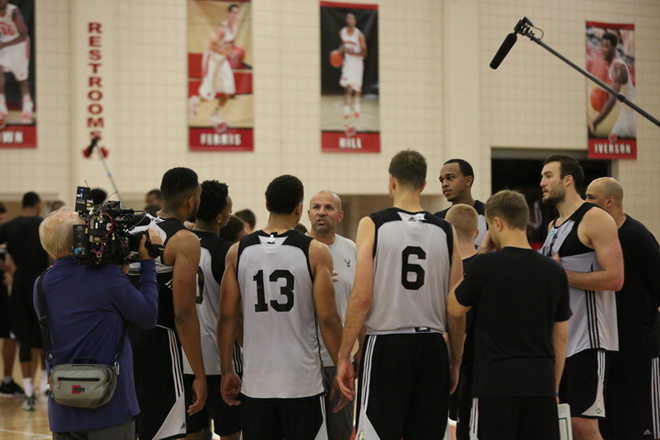 I’m really happy with the things I saw out of the team in training camp and the preseason. Getting away to Madison and the University of Wisconsin for a while was good for the guys. We practice in our practice facility all year and then the guys go to their respective homes. So I think it was good for guys to be together in Madison, get together for breakfast, lunch, and dinner, and just to build team chemistry. And then also, being a state team, we want to let other people see the guys on the floor, as well as out in the public, going to dinner and stuff. We’re building something. On the floor, guys were playing hard and communicating, and we had a lot of energy. Getting guys in the right spots and understanding what the wrong spots are is definitely what that time of year is all about. It’s a work in progress. During training camp and preseason, you look at different combinations, who plays well with one another, being able to take advantage of different matchups and understanding you have some depth in different positions. It helps guys understand that it’s an 82-game season, and things do change quickly in this league. If we’re going to achieve our goals as a team, everybody has to first accept our roles. Once we do that, then we move forward. 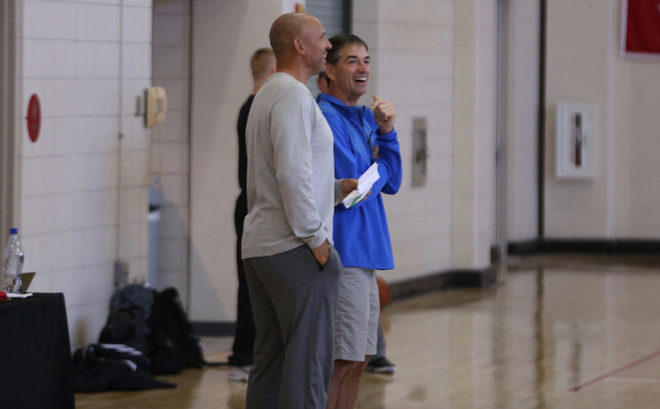 I had the honor of bringing Hall of Famer John Stockton in for our camp, and I was thrilled to give the guys a chance to learn from the best to ever do it at the point guard position. I’ve always looked up to respected John. 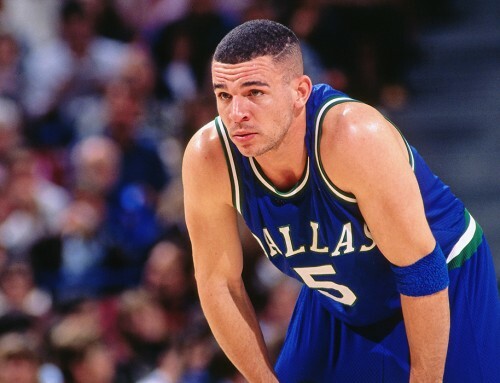 Having the opportunity to play against him early in my career, I know he was one of the hardest players to guard in the league as an opponent. 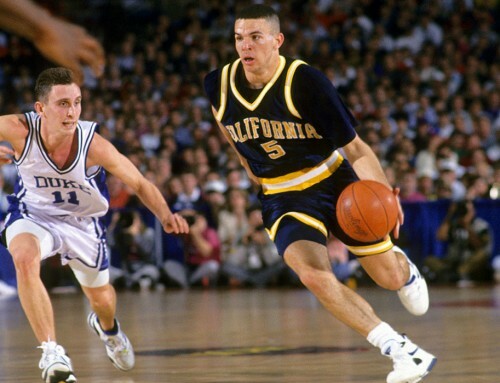 He was also the blueprint for success as a point guard. 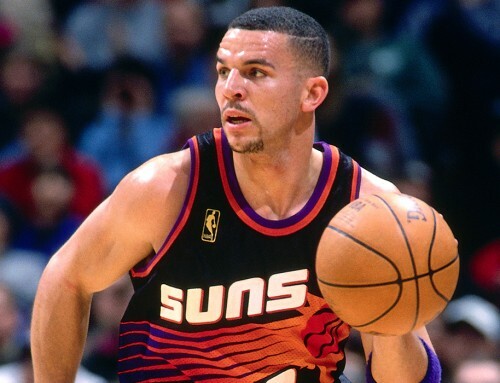 Being a younger point guard, I wanted to copy that. 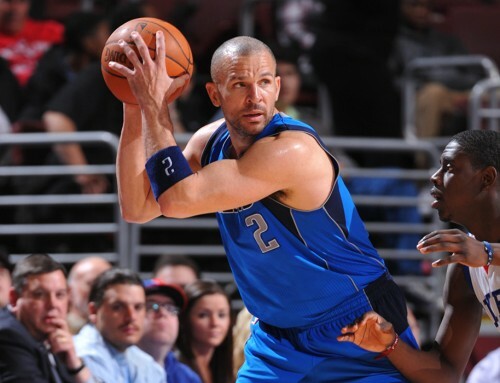 I looked at him and Magic as the two guys I wanted to follow and emulate. So I thought having him come to camp and talk about what made him have success on the court, his journey of being an NBA player, and most importantly sharing the basketball, would be beneficial. There’s no better person to talk to about passing, and sharing and getting your teammates involved than John Stockton. He talked about being able to make the game easy and involving everybody, not just one person. He preached that believing in each other and advancing the ball to someone who can have success with it, putting your teammates in a position to have success, is what makes a team successful. You look at the teams that have won championships, it’s all about ball movement and defense, moving the ball, sharing the ball. It makes the game a lot easier. The game has evolved so much from when John played, and when I played, but that’s the one constant that you hear from teams that do win the championship. I talk about those same things with my guys. So for them to hear John talk about and share the things that he believed in, that I believe in too, helped. One guy I hope it helped a lot is Giannis. I see great things in him. 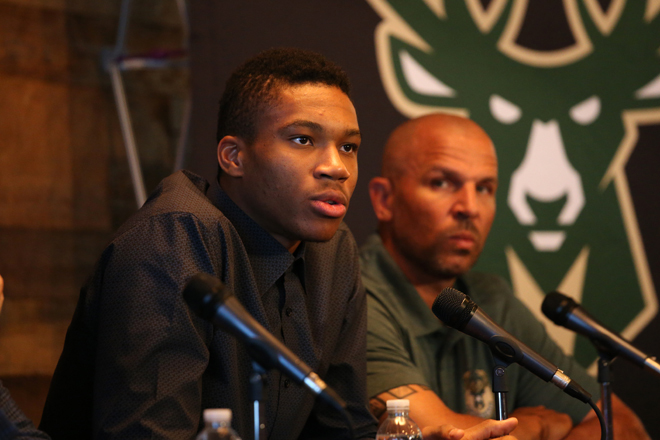 This offseason, our franchise and Giannis made a big commitment to each other. He is a huge piece of this organization going forward. We expect he is going to continue to keep working hard and he’s going to continue to get better, so we’re very lucky to have a very talented player like that and what he stands for. In this year’s camp, he was better able to process the position that he’s playing and help his teammates be successful while he’s on the court. 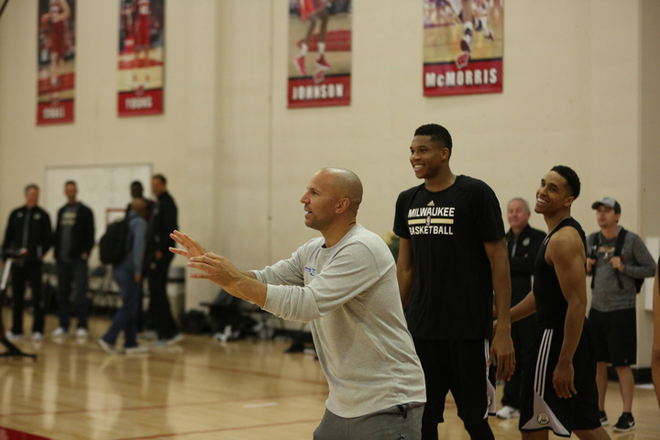 The thing that always stands out about Giannis is his work ethic and desire to get better. He’s always asking questions. “What can I do to get better?” I love that. He knows he has talent, but he wants to win. He wants to be a winner. He’s going to take another jump forward this year. I also believe we’ll see Jabari take another significant step forward this year. We saw the jump in the second half last season. He had some big games for us after the All-Star break. I think that was a matter of just getting comfortable playing against his peers again and gaining the confidence that “I can play with them.” He showed that, and I thought he came back with the attitude of, “I belong in this league, and I can play at a high level.” So it’s important for him to pick up where he left off. He should be one of the guys who leads us in scoring. He has a knack for scoring the ball. He also plays both ends extremely well. So I think you’re going to see someone who understands what’s coming. Last year could essentially be considered his rookie year, and because his work ethic during summer and throughout the season is always high, we expect great things from him. For both of those guys, it’s important to understand that we didn’t achieve what we wanted to last year, but you take it and learn from it. Because although the outcome wasn’t what we wanted or expected, individually there were some guys who got better. You still want them to understand that you can’t be satisfied. You’ve got to stay hungry. I thought Giannis, and Jabari, and a lot of the guys did that this summer. I’m entering my third year here in Milwaukee and my fourth as a coach overall, and it’s been one of the great challenges of my career and my life. Coaching is difficult. 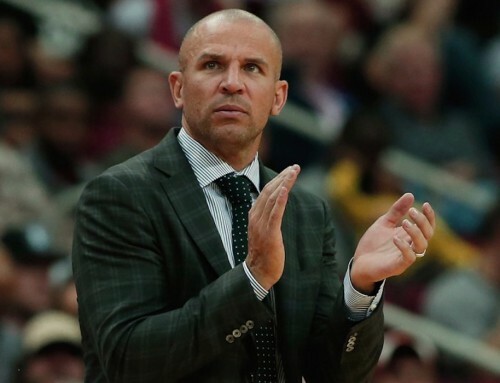 There are some very good coaches in this league with very talented players and you’re trying to get them to do something that they don’t always want to do. They’re not just going to always agree with you and let you do that. That’s actually the fun part, getting them to see what you see. It’s hard, but it is fun to coach, and I’ve got a great group of young men who come out and compete on a nightly basis and they play hard. That’s where the enjoyment comes from for me. The win-loss, that comes with it, but to see the guys get better, as a team and as individuals, is the fun part. I’ve always talked about being patient, working through the process. Things might not go well in a drill, but we can always go back and do it again. We come back the next day and you can see the improvement. I think that is one of the biggest parts of this job, to just understand that the process takes time and things just don’t happen as fast as you want. It’s also a matter of growth and building relationships, just being around my guys more, and understanding what they are capable of doing. By learning the limitations of some guys, I can help them improve and surpass that, and seeing them smile when they do is rewarding. It’s a different reward because I’m not playing. I don’t get an assist. I don’t get a rebound. But trying to help the guy who has the ball, where I can say, “Hey, you might want to take a look at this,” and they have a little success with that, and you can see that their confidence is growing. That’s the thrill. That’s the fun part and I enjoy that. A lot of these guys grew up watching me play or they watch the highlights online. They’ll come up to me and ask how I did this or that. Sometimes, I just tell them it’s all luck. (Some of it was.) But I also try to share that it’s just about effort and learning, and not being afraid to fail. It’s alright to fail. But the next day, you have to ask yourself, “Did I get better?” A lot of times, these young men are afraid to fail or afraid to ask. The big thing is, if you’re trying, you’re going to fail. But what happens the next day when you come back? That’s the best part of the game. I happen to have the best coaching staff in the league as well. They work extremely hard and I’m very lucky to have these guys. They put in long hours to help the guys get better, and that helps me out a lot. There’s also a constant evolution to being a coach in this league. It feels like a lifetime, but I’m still only a little over three years removed from my playing career. Yet the game has already changed so much from when I was playing to today. When I first got into coaching, I’ll admit there were times I wished I could throw a uniform back on, and go out there and do it. I try to stick to shooting. It’s just for fun and not to try to show up anybody. We do talk trash to one another, though, and that’s a good time, because they do like to talk, and it’s a chance to bond with my guys. Also, it’s an opportunity to see how they handle different situations of trash-talking because guys talk a lot in this league. But I know my role. The players are very talented, and very smart, and know how to play the game. So as a coach, I’m just trying to put guys in the right position and give them a chance to have success. That’s the hard thing. We can do it in practice, but we’re trying to do it at a game-like speed, which could be a lot faster. So, just understanding those things as a coach, the more I can do it, hopefully, the better I can get. I’m still learning the game. There’s a lot to learn about the game of basketball. 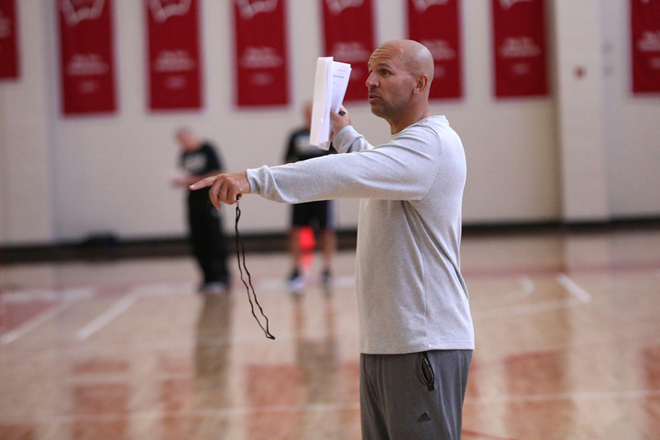 Sometimes you might think you know something, but when you hear another coach, or you go to a clinic or something, you always learn something new about basketball. And that’s another fun part about coaching. I find it challenging—and like I said, difficult. But it’s fun and I’m enjoying it.